New Delhi-A group of 40 Indian Diaspora youth called on the Union Minister of State for Home Affairs, Shri Kiren Rijiju . The participants from eight countries are in India as part of the 25-day visit under the 49th Know India Programme (KIP), being organised by the Ministry of External Affairs in partnership with Andhra Pradesh Government. Interacting with the participants, Shri Rijiju said the Indian Diaspora should act as ambassadors of India’s growth story and spread the good word about their experience in India upon their return. Government recognizes the importance of the Indian Diaspora and has a well laid down policy for engaging with the Diaspora community. Our Diaspora community has been an important partner in India’s development. Over the course of your visit across India, you must have seen the development happening across the country, he said. 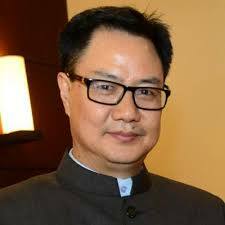 Shri Rijiju said the government has instituted many revolutionary reforms for accelerating the development of the country that offer tremendous gainful opportunities to Diaspora.Government of India has over the last four-and-a-half years launched several measures / programmes with scope of foreign/ NRI investment like Start-up India scheme, Make in India project along with significant reforms to improve Ease of Doing Business, Liberalization of FDI norms etc. The Government of India has given special focus on disinvestment strategy which offers significant scope of investment to NRIs, he said.